Keeping a cement plant clean is a major challenge. Basically, a cement plant is divided into the areas of raw material processing (raw mill), storage hall, kiln, clinker storage, cement mill and cement storage (silos) and the packing plant. One supplier of cleaning equipment for such facilities is Wieland Lufttechnik. Since 1959 Wieland Lufttechnik has been one of the leading manufacturers of industrial vacuum units, truck mounted vacuum loaders and stationary vacuum cleaning, vacuum conveying and dust extraction units. Its vacuum units are used in many different sectors of industry. For a large number of special applications,Wieland has developed tailored solutions, including for the cement industry. To clean most areas in the cement plant as much as possible, many Wieland customers decide from the outset to buy a ‘BlowVac’ vacuum truck model. This can easily be connected to a suction pipeline which is installed inside a production building and after completion of the cleaning job it can drive to another place which should be cleaned afterwards. Stationary (KS) vacuum systems are installed mainly in the cement mill and in the silos or everywhere when the vacuum system should be connected to a long suction pipework. If there is not so much spillage in the packing plant, a portable vacuum unit like the MaxVac Compact 110 could be sufficient. Sometimes this is also connected to a small suction pipeline of, for example, 20 metres length along the conveyor belts. Due to the larger quantity of spilled material in a cement plant, a mobile suction system with a collection of more than 5m3 should be recommended. This is not only because of the larger collection capacity, but also due to the larger hose diameter and longer suction distances. The power of the airflow may actually not fall below 3,200m3/h. The smaller BlowVac model 3200 and 3700 is often supplied on an in-plant trailer. Of course road trailers are also possible. Most flexible are the BlowVacs if they are mounted on a truck. Big companies like HOLCIM/LaFarge Cement mostly use the large BlowVac SL 8200 TG. This also makes sense because it has all the important advantages, such as large collection capacity, large airflow of 8,200m3 and vacuum performance of 800mbar. Additionally these vacuum system can be equipped with a blowing device, which is required when transferring the cement dust to and from cement silos. In some cement plants, the rotary kiln is heated with coal or fluff made from waste material. The coal is crushed in a mill to coal dust. Therefore the vacuum cleaner must be explosion- proof. Piping is always required because the coal mill has several floors. It is possible to use the smallest unit, the MaxVac 110 Atex 3 D in this situation. Larger systems are equipped with vacuum pump KS and a filter separator with pressure relief valve (EVN). Fluff material consists of plastic waste and other debris which is highly inflammable. Most of the fluff is classified as explosive, which in turn makes explosion protection required. 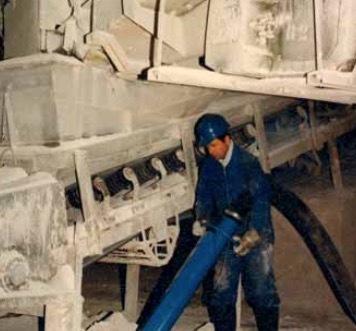 For a cement plant, a vacuum suction system for cleaning purposes is always a wise investment. Often, the collected material can be re-used again as raw material in the process. most of the sub-Saharan area. West Africa is covered by Proxima in Nigeria. Wieland closely co-operates with its customers in order to optimize its vacuum solutions for each application. The company has two modern production sites in Erlangen and Sulzbach- Rosenberg, Germany. Currently, it has approximately 140 employees in Germany. It has an owned sales organization in France, and a licence partner covering Australia. Long-standing agents and partners in most countries ensure a world wide presence. Shipyards: maintenance work for ships. Power plants, waste incineration plants: maintenance of an electro filter; and vacuum cleaning in a power plant. Corn silos and corn mills: floor and plant cleaning in a corn mill; and vacuum cleaning in a corn silo. Construction industry: vacuum extraction of gravel from roofs; vacuum extraction of ballast; and vacuum digging around a hot water pipeline. Steel plants and metal smelters: vacuum cleaning in steel plants; and extraction of large amounts of suction material in steel plants. Metal working industry: cleaning of machine-tools; vacuum extraction of chips and coolant from a metal working machine; and vacuum cleaning of a machining centre. Cleaning of machines for gear components: cleaning of pallets after the machining cycle. Building material industry: cleaning of processing equipment in a cement plant; and vacuum extraction of large amounts of chalk dust. Raw materials: extraction of ceramic (raw material); vacuum extraction in underground mines; and cleaning of conveying equipment in a gravel plant. Foundries: vacuum extraction of foundry sand from forms for ship propellers; factory cleaning in foundries; and vacuum extraction of foundry sand. Paper industry: cleaning of machines for paper bags; and cleaning of machines making decoration paper. Chemical industry and minerals: industrial cleaning; and cleaning of processing equipment in a salt plant. Printing industry: cleaning of offset printing machines. Car industry: vacuum cleaning of a machining centre for brake callipers. Glass production and glass processing industry: vacuum extraction of large amounts of quartz sand and broken glass; and vacuum cleaning in a glass plant. Craft: extraction of quartz dust created by stone- mason work. Wood working industry: vacuum cleaning of a painting plant; and vacuum extraction of wood dust and chips. Cleaning contractors: industrial vacuum cleaners and mobile vacuum units. Plastics industry: extraction of plastic chips from a broaching machine; dust extraction from a conveyor belt; and vacuum cleaning of an extruder. Food industry: vacuum cleaning in a corn mill; extraction of dried herbs; and vacuum cleaning in an industrial bakery. China ware and ceramic industry: vacuum extraction of ceramic raw material; and vacuum extraction of large amounts of kaolin. Textile industry: manual cleaning of machines and plant. Public transport: vacuum cleaning of buses; and stationary vacuum system for the cleaning of regional trains. The advantages of an electric material handler, combined with the flexibility of a mobile machine, is what the new SENNEBOGEN 821 offers with its integrated Powerpack. At first glance, the new SENNEBOGEN 821 M “E” appears to be an ordinary material handler. However, as soon as the operator turns the key, you hear the difference. Or, rather, you don’t — the quiet 90kW electric motor starts up and goes to work. It’s only then you notice the cable plugged into the undercarriage. Since the new SENNEBOGEN 821 now working at the MEAB waste recycling centre is primarily used indoors, the site’s decision- makers had quickly opted for electric drive. In addition to low operating and service costs, the electric machine eliminates any need for exhaust treatment and particulate filters in the work zone. The electrical power itself is environmentally friendly, generated just a few metres away using landfill gas. The advantages of electric drive are widely known, but the next notable feature of this unit is more of a surprise. MEAB requires the machine to be driven quickly out of the recycling bay and relocated for other duties. When it’s time to move, the operator simply removes the large plug, rolls the power cable up on the drum and starts the diesel powerpack that’s built into the 821’s counterweight. Then he just switches the motor to diesel mode and the waste handler is ready to roll. This unique concept that combines the greatest mobility with the advantages of an electric drive was developed by SENNEBOGEN. Instead of a counterweight, the rear of the material handler contains a powerful diesel Powerpack. This provides the power to the motor. As well, it has been designed to allow all of the hydraulic functions to be operated when on the Powerpack mode. With just a few steps, the electric machine can be driven anywhere without having to worry about being tethered to its power supply. Thanks to the integration of the Powerpack into the counterweight, the 821 remains exceptionally manoeuvrable and compact, and fully utilizes its strengths as an expert recycler. SENNEBOGEN has been a renowned company in the global material handling industry for over 60 years. Based in Stanley, North Carolina, within the greater Charlotte region, SENNEBOGEN LLC offers a complete range of purpose-built machines to suit virtually any material handling application. Established in America in the year 2000, SENNEBOGEN LLC has quickly become a leading provider of specialized equipment solutions for recycling and scrap metal yards, demolition, barge and port operations, log-handling, transfer stations and waste facilities from coast to coast. A growing network of distributors supports SENNEBOGEN LLC sales and service across the Americas, ensuring the highest standard of professional machine support and parts availability. For more than 50 years the Muhr family company has stood for quality in hydro-power, process water and bulk handling technology. Its specialized experience for the functional interaction of hydro-power and mechanical process technology is founded in the roots of mill construction. Building on the experience from this traditional technology of grain processing by means of water power, Muhr has continually developed new solutions in the associated areas of hydro-mechanical equipment, mechanical water treatment and bulk handling technology. Today Muhr supplies worldwide leading companies from the most diverse of areas, such as energy, chemicals, foodstuffs, cement/chalk/plaster, system construction and mill operations, of course. An essential part of the Muhr philosophy has always been efficiency in all respects: maximum loading performance, optimized interaction between every process component, highest reliability, dust-free loading for protection of environment and operating personnel. For this reason Muhr has successively developed a lot of innovative details which culminates in an impressive range of bulk loading systems and bulk loading technology in general. Muhr Bulk Loading technology starts with any kind of docking devices, mainly pneumatically operated, leads to loading spouts both for open and closed or even combined loading and ends in complete loading plants for highly efficient railcar- and truck-loading. Muhr loading spouts for closed loading are fitted either with the rubberized MBG loading cone or the Muhr-exclusive MVS pneumatic sealing collar which grants 100% dust-free loading. By using foodstuff-approved materials and replacing the conventional bellows with telescopic tubes in stainless steel (also sealed with Muhr MVS-TD sealing collars), the loadings spouts are perfectly suited for loading of hygienically sensitive materials. For open loading operations, Muhr offers the MBO loading spouts series. These systems are fitted with exterior bellows for open loading of powdery granular and very dusty products, or with telescopic tubes for coarse bulk and low-dust products. All spouts are optimized for highest loading performance with minimum dust emissions. For this reason the outlet is equipped with the reliable Muhr dust hood with energy brake. In cases of extremely dusty materials, the spouts can be equipped with the FSR Flow-Speed-Retarder or — which is the latest option within the Muhr bulk programme — the Muhr Cascade System CSR (Cascade Speed Retarder). Both systems care for absorbing the fall energy of the loading material and eliminating dust. As a third possibility Muhr combines both the MVS and MBG loading spout with the MBO dust-hood and creates a loading spout which can be used for open and closed loading — simple and without compromise, efficient and dust-free. Different solutions for lifting and lowering the dust-hood (for closed or open loading) enable perfect customization to any loading facility. Apart from these main types any component of this selection can be optionally equipped with various modules for additional adaption to customer demands and increase of loading quality and efficiency. process and eliminates out-falling product during lifting of the loading spout.Additionally the can be chosen different lifting systems, level indicators, vibrating units and many other details. And if it is not possible or economical to connect the loading equipment to existing extraction systems, a Muhr loading system with integrated filter unit IF might be the ideal and economical solution. But the real highlight is the intelligent module concept of Muhr which allows for the combination of all these features in almost any composition. With rising demands on loading performance, flexibility in loading position and economic efficiency in general Muhr started to design a loading spout positioning concept. The concept is based on the positive experiences with modular configuration and flexibility in design which makes it possible to create an intelligent loading facility for every customer. With optimal configuration of all components and perfect integration Muhr railcar- and truck-loading systems gain maximum output of the resources used. The flexibility in design allows free and exact positioning of one, four or more loading spouts in any direction (x-, y-, z-axis) and discharging different feeding systems by flexible positioning of inlet docking device. In conclusion: Muhr Bulk Loading Technologies stands for intelligent loading facilities from a single source. No matter if a single component is needed, an existing loading facility has to be refurbished or a modern, sustainable loading solution has to be developed – the experience of more than 5,000 successfully realized projects worldwide grants for reliable products and professional project handling. v combined shiploaders and unloaders; and v pontoon based floating transshipment. Further to the success of two units continuous ship unloaders for Zhujiang Power Plant China, which have been in commercial operation since April 2014,TKIS-MH won a new contract through an international tender for the new chain bucket elevator continuous ship unloader, for the power plant development of Baolihua New Energy Co. Ltd. Of Guangdong, China. The order was placed in September 2015. This CSU will be designed for an unloading rate of 2,000–2,200tph (tonnes per hour) and ship sizes up to 100,000dwt, representing the third largest CSU for coal in China, while the others supplied to Huayang PP in China in 2007 and Huilai PP in China in 2012. For thyssenkrupp, this follow-up order not only a means of being awarded a further order, but also represents continuity with respect to design, supply, construction and management and demonstrates the client’s appreciation of and satisfaction with TKIS-MH’s performance to date. The delivery to site and commissioning of the new CSU is schedule for April 2017. The commercial operation can start from June 2017. With this contract,TKIS-MH, has once again contributed to the development of China’s coal ports and power plants, among with other equipment of more than 60 machines for car dumpers, ship unloaders, shiploaders, stacker-reclaimers, etc. in the past five years. In December 2014 thyssenkrupp Industrial Solutions AG received an order for the turnkey supply of a new drum reclaimer for voestalpine AG in Linz, Austria. The machine is scheduled to start commercial operation in May 2016 and will replace a more than 40 years old drum reclaimer supplied by former Weserhu¨tte AG which is today integrated in thyssenkrupp Industrial Solutions AG. Due to its design the drum reclaimer ensures a homogenized material composition at a continuous reclaiming of the iron ore fines-mix stored in the stockpile. The machine feeds the subsequent sinter plant with a steady flow of blended product which is uniform in respect of quality and quantity, thus ensuring that the sinter plant is working under constant load and most economically. The blending stockyard consists of four parallel stockpiles. The drum reclaimer is designed to operate variably on each of the four stockpiles and can be transferred from one stockpile to the other by a transfer car which operates in cross direction to the reclaimer runway. By receiving this order, the thyssenkrupp Industrial Solutions AG reference list for drum reclaimers counts now 65 machines with the first one having been supplied in 1967. Ust Luga is the largest port project to be built in Russia in the last 20 years and it is in this mostly ice-free port on the Baltic Sea, St. Petersburg region, that Russian coal from Siberia and other regions of Russia is handled and loaded, most of it destined for export to Western Europe. A key feature for the successful operation of this coal terminal are the two rail car dumpers, supplied and commissioned by TKIS-MH, which enables the port operating company to achieve a capacity of 7,000tph for unloading coal from rail freight cars. When the terminal is operating at full capacity, 700 rail freight cars can be automatically unloaded each day and an annual throughput of > 14 million tonnes coal achieved. TKI-MH’s success in Ust Luga is a good basis for development of future increasing requirements for materials handling equipment. In September 2015 German based Materials Handling Division of TKIS-MH was awarded a third contract for engineering, supply and commissioning of one car dumper. For TKIS-MH, this follow-up order not only means a further order, but also represents continuity with respect to design, manufacturing and management for high capacity handling system and demonstrates the client’s appreciation of and satisfaction with TKIS-MH’s performance to date. The new wagon unloader comprises a tandem car dumper for handling two 100t railway wagons, one positioner to move the 36 wagons in the rake and one transfer car to return the empty wagons back to the rail track. With this design the railway facility can be kept to the minimum and an automatic operation of moving and unloading of coal wagons from arriving of the train up to pick-up of the empty rake is realized. In July 2012,ThyssenKrupp Resource Technologies GmbH, Business Unit Materials Handling has been contracted by OCP S.A. (Office Che´rifien des Phosphates, S.A.), the leading phosphate producer of Morocco, to supply eight Full Portal Reclaimers to be operated within the Morocco Phosphorous III & IV Complex at Jorf Lasfar, Morocco where, as part of the strategic development plan, OCP S.A. will establish four new ODI (Owner Direct Investment) integrated DAP granular fertilizer manufacturing plants on green-field plots. These machines shall be delivered and erected in sequences within two to three years from the beginning of 2014. Thanks to TKRT’s proven new technology of high speed / high rate portal reclaimers for which the weak element — the roller chain — has been replaced by a track link chain which permits higher chain speed the portal reclaimer itself could be designed with only two scraper booms i.e. one arrangement of one main and one auxiliary scraper boom mounted laterally to the portal structure and connected together by a knuckle arrangement instead of 3 scraper booms which are normally required for such a high handling rate. In 2015 a new thyssenkrupp shiploader arrived in Narvik, Norway, to service LKAB Norge AS, Europe’s biggest iron ore supplier. The deep-draught, ice-free port is the biggest export harbour for LKAB in northern Norway, with a capacity of almost 20 million tonnes per annum of iron ore/pellets. LKAB’s requirements called for a new linear shiploader, to be installed on a new pier, but with identical main dimensions to the existing shiploader, so that a second shiploader of the same design could be installed later on the old pier. thyssenkrupp Industrial Solutions’ contract comprised the design, manufacturing, protection, packing, assembly, delivery to site, installation, commissioning and testing of one shiploader, with the option for a second unit at a later stage. The new shiploader has a loading capacity of 11,000tph for iron ore and 9,000tph for pellets. The main dimensions are a maximum length of 144m from pivot point to loading chute in extended position, and a maximum height of 50m. The shiploader is designed to load ships between 5,000 to 180,000dwt, and its deadweight is 1,700t. The shiploader has a special design with the rear side supported on a fix point on land and the front side supported on a travel gear on the pier. The main beam is equipped with a driving shuttle and a liftable discharge boom. The modular set-up of Schulte Strathaus’ new STARCLEAN® belt-cleaning system offers solutions for numerous applications from a range of standardized components. This modular principle guarantees fast delivery times for both complete systems and spare parts, regardless of belt width, belt speeds or type of material conveyed. For use in reversible conveyor systems and time interval- based cleaning. Enables non reversible scraper blades in reversible conveyor systems, by automatic retraction when the belt direction is changing. Optionally as autonomous system with a preconfigured control unit incl. display and keypad or without control unit, for integration into existing belt conveyor control systems. Quick tensioning device for easiest tension adjustment. Durable drive unit for reliable operation. Retrofit into existing systems type 830. Can be combined with primary or secondary belt scrapers. Today, Schulte Strathaus and its subsidiary Cyrus are a multinational production, engineering and service company certified according to ISO 9001:2008 and holding the BGH quality symbol ‘Safety with System’ as a member of VDMA, the German Association of Plant and Machinery Manufacturers. Terex Port Solutions (TPS), part of the Material Handling & Port Solutions business segment of Terex Corporation, continues to systematically strengthen its position in the Asia Pacific region with four new mobile harbour cranes. Two additionalTerex® GottwaldModel6mobile harbour cranes from the large crane family, ordered earlier in 2015, have been in use in the Port of Napier on New Zealand’s North Island since November. On 4 December 2015, Northport Ltd. (Northport) not only officially launched its container hardstand area, but also a Terex Gottwald Model 4 mobile harbour crane from the medium-sized crane family at Marsden Point, also situated on the North Island. Finally, the world’s first Terex QuaymateTM M50 mobile harbour crane from the small crane family of TPS, which has been developed with German and international engineering expertise and is manufactured in China, will be delivered to Australia at the start of 2016. Coal mining plays a major role in the Australian economy. Ten per cent of all coal deposits worldwide are ‘Down Under’, making Australia the biggest coal exporter. Large deposits are found in the state of New South Wales, where the Newcastle Coal Infrastructure Group (NCIG) is based. It operates one of the most important export terminals at the port of Newcastle. A complex infrastructure is required to ship the coal from there to destinations all over the world. For the NCIG transport system, the ContiTech has produced and supplied several steel cord belts in recent years, helping to set up a total of three platforms. Via the project company Aurecon Hatch, NCIG awarded ContiTech Australia (formerly M.I.R.S. ), the order to set up the first platform in 2008. ContiTech in Northeim, Germany, produced an approximate length of 10,000 metres of ST 1400 steel cord belt with a width of 2,500mm. It is made of an energy-saving rubber compound that has made it possible to significantly improve visco-elastic properties, thereby minimizing indentation rolling resistance on the conveyor belt system. As a result, energy consumption during transport can be lowered by up to 25%, allowing for a reduction in energy costs and CO2 emissions overall. ContiTech additionally produced steel cord belting type ST2500 for this stage of the project. It is used to transport the coal onto the freight ships. In order to ensure that the individually delivered sectional lengths were correctly spliced on-site to form a conveyor belt, ContiTech arranged a training course in Northeim in 2009. At it is, the Australian installation partner received instruction as to the correct procedures for splicing the sections. “By doing this, we were able to ensure the best possible outcome,” says Van Leeuwarden. In the spring of 2010, an order then came in to set up the second platform. A further 8,000 metres of steel cord belting of the same belt types were used here. To help the team connect the individual conveyor belt lengths, ContiTech service staff members were on hand locally to set up the required vulcanization presses and further optimize the process. In 2012, thanks to the successful implementation of the first two subprojects, M.I.R.S. and ContiTech also received the order for the third and final stage of the project — another 8,000-metre- long steel cord belt — which was delivered in several stages by September 2012. Continental develops intelligent technologies for transporting people and their goods. As a reliable partner, the international automotive supplier, tyre manufacturer, and industrial partner provides sustainable, safe, comfortable, individual, and affordable solutions. In 2015, the corporation generated preliminary sales of approximately €39.2 billion with its five divisions, Chassis & Safety, Interior, Powertrain,Tires, and ContiTech. Continental employs more than 208,000 people in 53 countries. The ContiTech division is one of the world’s leading suppliers of technical elastomer products and is a specialist in plastics technology. It develops and produces functional parts, components, and systems for machine and plant engineering, mining, the automotive industry, and other important industries. Together with US company Veyance Technologies Inc., which was acquired at the beginning of 2015, ContiTech generated sales of approximately €5.4 billion (pro forma basis) in 2014 and currently employs approximately 43,000 people in 43 countries worldwide. DUSTEX® dust suppression systems for the reduction of dust emissions. It is well known, that dust is not only disturbing, but even dangerous to health. For this reason, there are legal rules in most countries for a reduction of dust emissions. The degree of effectiveness of dust suppression with water depends on many parameters. Beside the affinity of the material to generate dust, the plant conditions such as conveying speed, fall height of the material, as well as ambient conditions have a considerable influence on the effectiveness of a dust suppression system. When designing a dust suppression system, this means far more than just putting some water on some material. The expertise of the supplier of such solutions is the crucial factor for the effectiveness of the dust suppression system. Nevertheless, sometimes the easy solutions are the best ones, particular if we look at the ways of reducing dust emissions on unmade roads. One way of reducing dust emissions as they appear by the transport of bulk goods on unmade roads is the use of sprinkler systems. The throwing range of those sprinklers is up to 50m, depending on the water pressure. So they are a good solution to keep unmade roads moist and free from dust. The disadvantage of those systems is that water consumption is too high. But this can be solved by a control system which ensures, that the sprinkler works only if the streets are dry. The big advantage is that they can raise moisture levels within a very short time. electrical valve in a stainless steel cabinet were placed primarily at traffic-intensive sites and crossroads. By selecting sprinklers with matching throwing-ranges and a targeted placement of the sprinkler with overlapping irrigation radii complete coverage of the surfaces could be achieved. In addition to the sprinklers the company has chosen a DUSTEX fog blower for various changing points needing dust suppression. In many cases transporting goods by river going vessels is a cost-efficient alternative compared with other means of transport. In some areas, it even provides the only viable method to reach remote areas. Reliable barge-loading systems hence offer time and cost saving solutions. They ensure the optimal and efficient loading of vessels. loading systems for customers in Asia, Africa, South America and Europe and is therefore well aware that short docking times represent an essential criteria in designing loading systems. The faster a vessel is loaded with bulk or bagged goods such as grain, fertilizer or cement bags, the shorter the docking times and the more efficient transport becomes. SMB therefore uses a two-step production method: Loading systems are first designed directly at the Quickborn site near Hamburg. Here, all mechanical and electronic modules are individually developed and produced according to the requirements. They form the basis for custom-made implementation of projects and their subsequent installation at site. SMB can also draw on many years of experience for upgrading an existing facility or increasing an existing capacity. The design of shiploaders is adapted to their future requirements and tasks.The range extends from systems for vessels of 5,000dwt up to 120,000dwt, providing a loading capacity of up to 2,500tph (tonnes per hour). The systems are designed for stationary or mobile use on rail, depending on the requirements. Three versions have evolved with regard to the various types of loads. The first version is intended for bulk goods: it uses dust suppression type chutes to optimize the loading. This leaves the material handled with minimal degradation whilst encapsulated dust extraction units help collect dust generated. The extent of degradation is significantly reduced by using contoured chutes. A further version is bag loading. A cantilever beam combined with a conveyor belt swivels over the ship. The bags slide along a spiral chute into the loading area. A rotary loading head that can be turned by 180° is attached at the end of the spiral chute. The loading head carries a telescopic conveyor belt with two extension options. This allows positioning of the bags in the furthest corner of the hatch with an accuracy range of centimeters. This system may be optionally equipped with a central rotating plate for even alignment, a telescopic loading head or even a telescoping spiral chute. The third version includes a spiral chute and freefall chutes mounted on the same cantilever beam for combined loading of bags and bulk goods. The loading is then determined by the goods. “We base each of our systems on the specific requirements of the customer to create an individual solution,” explains Andreas Heckel, Managing Director of SMB International GmbH. “Many systems handle up to 1,500tph — but much higher throughput is possible.” Quickborn shiploading systems have proven their performance over many years of service. Long-term economic efficiency is another, obvious goal for the designers. Lower handling and operating costs, in addition to the shorter docking times, allow customers to make optimal use of waterways. “Systems must adapt to the circumstances, not the other way around, particularly when the infrastructure conditions are not optimal,” explains Heckel. This company philosophy distinguishes the German company from its competitors. Its success has encouraged SMB to continue along this route. “We have deliberately chosen a high manufacturing focus at our own site. This allows us to ensure excellent quality and guarantee reliability. Naturally, we want to do this to comply with customer requirements. However, our growing demands also act as a continuous incentive,” Heckel sums up the situation. The two companies SMB and MBA focus upon the material handling segment. The planning, development, manufacture, global distribution and servicing of highly complex, automated loading systems, filling systems, measurement technology for fill levels and conductivity, palletizers and shiploading systems form the comprehensive product portfolio. The SMB Group has consciously opted for a high degree of in-house manufacturing at its site in Quickborn near Hamburg. This enables customers’ requests to be implemented in a spontaneous, targeted and rapid manner, whilst retaining the same high quality. A high-end mechanical and electrical manufacturing facility coupled with the focus on pre-assembly allows the assurance of qualitative and delivery reliability. Highly qualified installation and service teams work on domestic and global projects. The distribution network, which has operations worldwide, ensures swift and effective information-sharing and co-ordination. Shoreham Port has recently taken delivery of a new SENNEBOGEN 880M ‘special’ port material handler; this new addition has increased its fleet to five SENNEBOGEN port material handlers, with 2 x 870 M specials, 1 x 880 EQ and now 2 x 880 M specials. In summary this SENNEBOGEN 880 is fitted with a 26m straight boom, four-axle wide-gauge mobile undercarriage, 2-metre pylon, spacious port cab (with additional trainer’s seat), special sea climate paint, cylinder protection and quick-release coupler with built-in rotator.